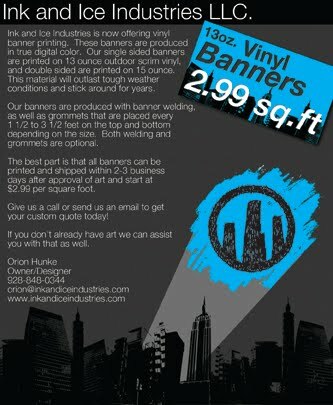 Ink and Ice Industries is now offering vinyl banner printing. These banners are produced in true digital color. Our single sided banners are printed on 13 ounce outdoor scrim vinyl, and double sided are printed on 15 ounce. This material will outlast tough weather conditions and stick around for years. Our banners are produced with banner welding, as well as grommets that are placed every 1 1/2 to 3 1/2 feet on the top and bottom depending on the size. Both welding and grommets are optional. The best part is that all banners can be printed and shipped within 2-3 business days and start at $2.99 per square foot. Give us a call or send us an email to get your custom quote today! If you don't already have art we can assist you with that as well. "Ink and ice" industries provides some of the higher standards of banner printing work. corporate. I am agree with your statement that they are printed with the main purpose to produce your company in high level.